I have been having so much fun! 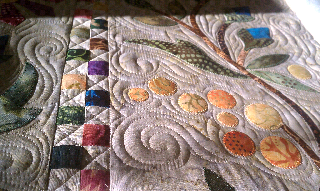 Got to love applique quilts and wool batting. Wow!! Love it, so graceful. You have breathed exuberant life into an already stunning quilt; well done. Thanks for giving me some great ideas! Great job!